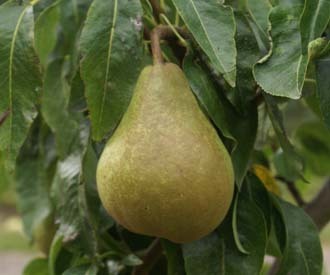 A new pear variety similar to Conference. Nuvar® Celebration was raised in 1972 by Dr Frank Alston at East Malling Research, Kent UK from a Conference crossed with Packham's Triumph and released as a new variety by Nuvar. Medium to large pyriform fruit. The light green skin is covered for the most part with brown russetting. The flesh is firm and crisp but sweet. Overall very similar in appearance and taste to Conference. An upright spreading relatively vigorous tree.